If your dog starts to lose his balance, he might be suffering the canine equivalent of dizziness. In addition to difficulty walking, a dog with dizziness might not be able to get up from a prone position. 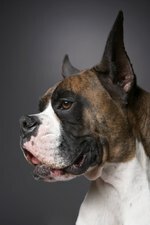 In an older dog, this balance loss can come on suddenly and severely. Dizziness in dogs can result from disease, poisoning or trauma. If you notice any signs of dizziness in your dog, take him to your veterinarian. Woman holding a small dog. Besides balance loss, a dizzy dog might start to circle or exhibit an odd posture, with a downward head tilt, with his body leaning in the direction of the tilt. If you try to turn him in the other direction, he will roll back to the original position. He might stagger or throw up. Your dog also might experience nystagmus, a situation where his eyes might jerk back and forth. Your dog's vestibular system regulates his balance. This system is based in his brain, with middle and inner ear involvement. When it's out of whack, loss of coordination and dizziness result. In aging dogs, who are more likely to be affected, the condition has the nickname of "old dog vestibular disease." Common causes include middle ear infections, stroke, brain tumor or brain lesion. Hypothyroidism is also a culprit in canines. The majority of canine vestibular diseases cases are idiopathic, meaning the cause is unknown. Tell your vet about any potentially related symptoms your dog displayed before the dizziness began, such as frequent ear scratching. Your vet likely will conduct blood and urine testing, along with X-rays of your dog's head. If she suspects a tumor, your vet might perform magnetic resonance imaging. Your vet receives clues from the nystagmus if a brain lesion is involved. If his eyes move up and down rather than back and forth, that indicates a lesion in the cerebellum. While your vet can treat the symptoms by administering anti-emetics to stop vomiting or antibiotics if she suspects an ear infection, there is no real treatment for vestibular disease. You'll have to help your dog navigate your house and yard, perhaps with a towel supporting his abdomen. Fortunately, most dogs recover to a significant degree within a few days after symptoms appear. It can take weeks before a dog completely recovers; many dogs retain a head tilt.